With 720p high definition video recording at 30 frames per second, faces and other important details will always be clear. 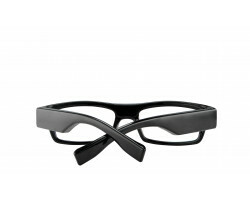 For still images, the glasses can be set up to take 5 megapixel quality photographs. 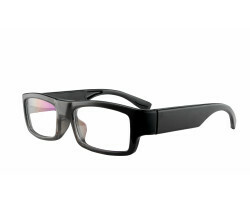 The Clear HD Video Glasses store 8GB of memory internally, so you can keep up to 90 minutes of HD video on the device. The battery life lasts up to 90 minutes between charges. To charge, simply plug the device in using a standard USB cable and you’re ready to go. 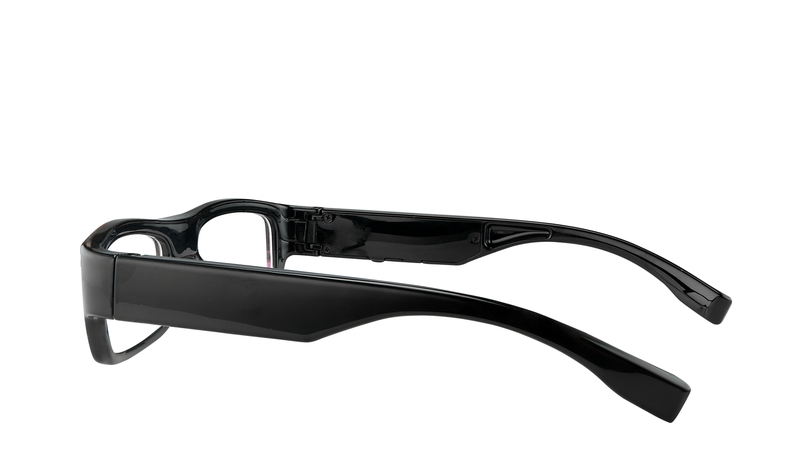 The Clear HD Video Glasses embed both a 90-minute battery and 8GB of non-removable memory. Since each 15 minutes of video consumes about 1GB, when the power runs out at about 90 minutes of use, the glasses will have consumed about 6GB—with 2GB (30 minutes) leftover. Obviously, you can turn the device on and off throughout the day to conserve battery life. To take advantage of the remaining 2GB while on the go, you may want to carry an external power pack for recharging between uses. Once memory fills up, you must transfer the footage to a computer and delete files from the glasses to start recording anew. Note: the HD recording resolution is fixed, so you cannot switch to a lower resolution to conserve memory. 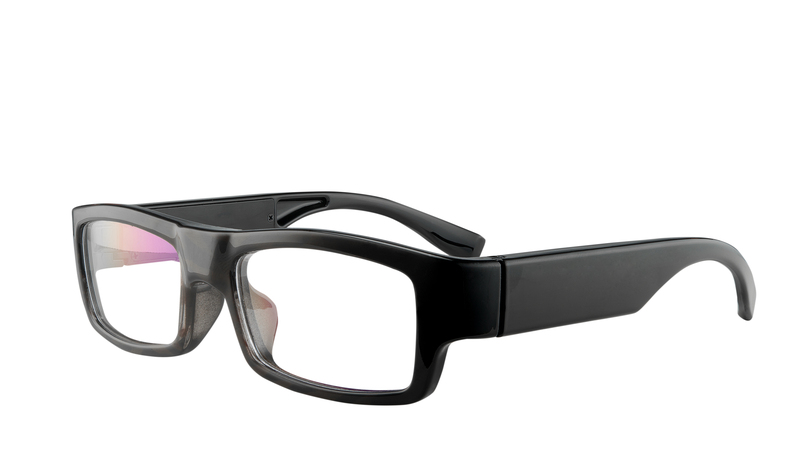 Do the Clear HD Video Glasses accept prescription lenses? Unfortunately, the product is not compatible with prescription lenses. Custom-made frames are not offered. That said, a willing optician may be able to fit corrective lenses into the frame. Alternatively, if your eyesight requires corrective vision, consider wearing contacts while using the Clear HD Video Glasses. If you must wear prescription glasses at the same time—and don’t care about how odd wearing two pairs of glasses at the same time looks—make sure to wear your prescription glasses under the Clear HD Video Glasses so as not to block the camera. Can people tell it’s a hidden camera? The lens is housed in the bridge which is dark colored and very difficult to spot. Unless someone looks very closely and knows what they’re looking for, it’s unlikely they’ll realize a lens is pointed at them from between your eyes. The buttons on the arm of the glasses are also obscured by being the same color as the glasses and do not protrude from the glasses. There are LED indicators so you know whether it’s recording, but these cannot be seen because they are on the inside towards your face while wearing the glasses. In everyday use, the Clear HD Video Glasses are extremely covert. Can the camera record in the dark? No. 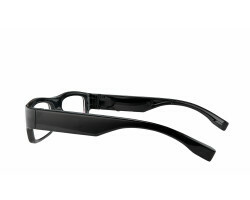 The Clear HD Video Glasses are best used in daylight or under well-lit conditions. They are not suitable for very dark environments. Is the camera difficult to aim? No. With the glasses worn straight, you aim the camera by simply looking at the subject. The field of view is 62° (horizontal and vertical), which means that whatever you want captured in frame should be in the central portion of your vision. If the subject is in your peripheral vision, slowly turn your head toward the subject. The viewing angle is fairly standard—not overly narrow nor super wide. What should you do if the camera fails to respond? Assuming the built-in battery is charged, you can reset your glasses by pressing and holding the reset button for 15 seconds. The reset button is located on the arm of the glasses in the pinhole below the LED indicator. Is the camera computer- and smartphone-compatible? The Clear HD Video Glasses are compatible with Windows- and Macintosh computers, but they do not work with iOS or Android devices. How do I set the date and time so that videos are correctly stamped? How do the glasses fit? 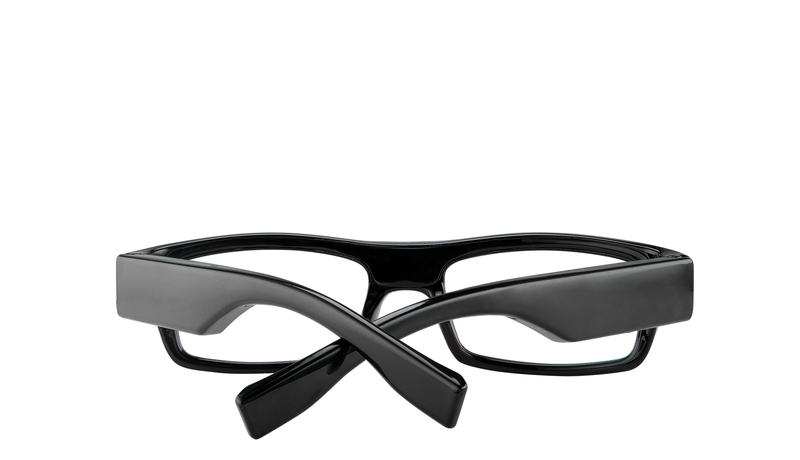 The Clear HD Video Glasses are one-size-fits-all eyeglasses. We haven’t heard many reports of the fit being an issue on this model.